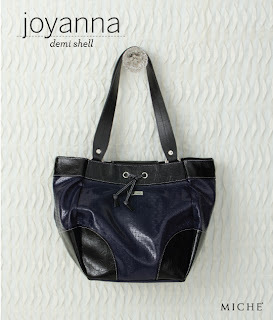 You may not be heading out to sea soon, but you’ll definitely feel like you’re at the helm and in control of your day when you carry the Navy-inspired Joyanna Miche Shell for Demi Bags on your arm. Delightful high-gloss navy blue faux leather in an embossed woven pattern is topped off with black detailing, white stitching and a chic knotted tie. Be sure to check out the chic “elbow patch” detailing on the bottom corners.